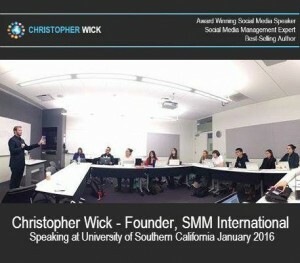 Los Angeles, CA – January 12, 2016 – Christopher Wick, Founder & Social Media Consultant, SMM International, was invited to speak with graduate students by the Clinical Professor of Communication and Director of Digital Social Media, on January 12, 2016, at the University of Southern California. 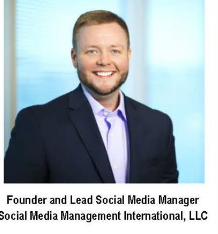 USC is the only premier university that offers a master’s program in Digital Social Media to graduate students throughout the world. Christopher lectured about “Three Tips on Becoming a Successful Entrepreneur and How to Become Hired by a Major Corporation.” Wick spoke about entrepreneurship, client case studies, hiring advice, business management objectives with results-oriented and return on investment strategies, small businesses and large brand companies. 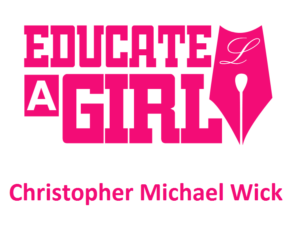 “We kicked off the first day of the entire semester by bringing it back to our “Why,” while bringing it back to our business,” says Christopher Wick, Founder & Social Media Consultant.